Poonam Bhisht did her schooling from MKP College and graduation from Dayanand Women's Training College, both of which are in Dehradun. She thereafter, did a basic and advance course in Pranic Healing in which she was also taught about crystals and meditation. She is also a qualified yoga instructor. 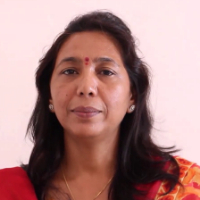 She has been practicing as a Pranic Healer in Dehradun since 2010. Pranic Healing is a system of energy medicine. It is a simple yet powerful & effective system of no-touch energy healing. It involves channelizing energy absorbed from the surroundings from the healer to the patient. It is to cure the person in pain of his ailments. "I did my schooling from MKP College and graduation from Dayanand Women's Training College, both of which are in Dehradun. I thereafter, did a basic and advance course in Pranic Healing in which I was also taught about crystals and meditation. I am also a qualified yoga instructor. I have been practicing as a Pranic Healer in Dehradun since 2010."